Musk dropped the news on Tuesday during an address at the International Astronautical Congress meeting in Guadalajara, Mexico, where he had promised to reveal how the company planned to send people to live on Mars. The plan comes less than a month after the company’s rockets were grounded following a mysterious explosion that caused a Falcon 9 to burst into flames on the launchpad. Since then, the company has released the results of an initial investigation, tracing the fire back to a breach in the rocket’s heliumsupply, and announced that it plans to take to the skies again by November. Right before the presentation, SpaceX released a mini-preview of what we could expect from its new Interplanetary Transport System. The system was previously called the Mars Colonial Transporter, until just a few weeks ago,when Musk changed the name after suggesting that it could take us to other destinations in the solar system. In the video, first, we see the rocket lift-off from Cape Canaveral’s Launchpad 39a with 28,730,000 pounds of thrust behind it. After stage separation, the spaceships parks in orbit while the booster returns to Earth—where it lands. A propellant tanker is loaded onto the booster to refuel the spaceship in orbit for its trip to Mars. The tanker returns to Earth and the spaceship heads for Mars. The solar arrays deploy and the ships coasts until it finally enter Mars’ orbit. The ship lands on the Martian surface and then we get a glimpse of the astronauts looking out onto the Martian plains. What we didn’t see in the video, however, is any kind of infrastructure that would support those astronauts to keep them alive after landing. Based on Musk’s comments, it sounds like SpaceX intends to send colonizers to a permanent city on the Red Planet. With 1,000 ships and 200 people per ship, Musk estimated that it would take 40 to 100 years to achieve a fully self-sustaining civilization on Mars. One of the big barriers to doing that is the cost, which Musk estimated at about $10 billion. The SpaceX founder detailed four ways that he believed a ticket to Mars would become a possible purchase for many people—similar to buying a house. These methods include using reusable rockets, refuelling the spaceship in space, and using a methane fuel instead of traditional rocket fuels. Finally, that methane fuel could be harvested on Mars itself. We also learned quite a bit about the rocket and what it would be like to travel to Mars. Just like the Falcon 9, the rocket booster on the Interplanetary Transport System will land and be re-used. (SpaceX has landed a number of its Falcon 9 rockets after flight, but hasn’t yet flown one of the used rockets back into space.) A key feature of the rocket re-usage plan is to send their Mars rockets back into space, so seeing a Falcon 9 rocket successfully make a second trip will be critical to convincing people that the plan is plausible. The new SpaceX rocket will be incredibly large, dwarfing even the company’s Falcon Heavy and the world’s last tallest rocket, the now-defunct Saturn V.
If being locked into a spaceship for months at a time with a bunch of your fellow humans sounds a little grim, though, Musk says not to worry. “It’ll be, like, really fun to go—you’ll have a great time,” he says. Key to doing that will be making the inside of the rocket comfortable for the long ride, which for initial trips will last 80 days. Musk says that he eventually believes a trip could be brought down to a single month. But whether this is really doable depends a lot on whether SpaceX can actually get the money together. 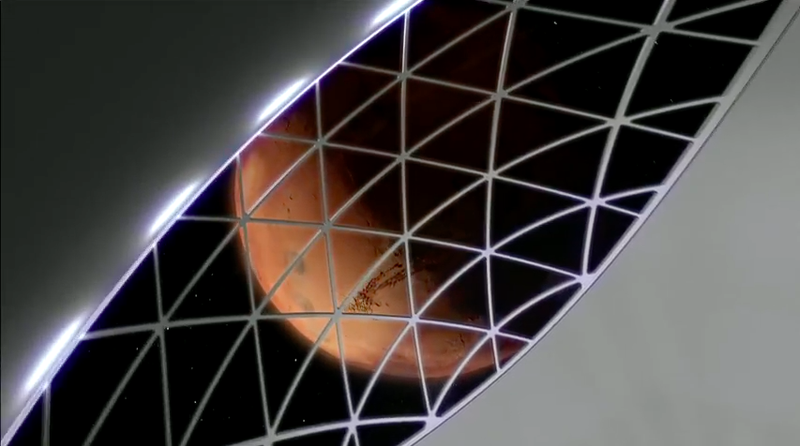 “I would say it’s going to be a challenge to fund this whole project,” Musk noted. He spent a lot of time today talking about the economics of an individual ticket, which he said could drop as low as $100,000. Musk hinted that he would personally be devoting assets to the project. “I really don’t have any other motivation for personally accumulating assets, except to make the biggest contribution I can to making life multi-planetary,” he said. But even then, there would still need to be significant outside investment. How quickly all this could happen would, in large degree, depend on whether that funding comes through at all. But if the money is there and all goes as planned on the technical side, Musk said we could see Mars flights begin as soon as 2023—although he cautioned that the timeline was still in-flux. 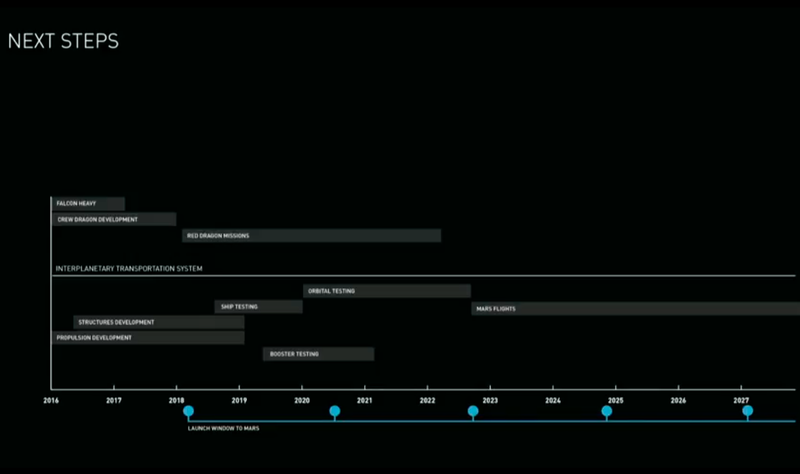 He also kept to SpaceX’s original date for when we would see Red Dragon missions head to Mars in 2018 with payloads between 2 or 3 tons. But while he described the project as a “self-sustaining city,” Musk did not go into detail about the kind of long-term infrastructure that would keep people alive once they got there. 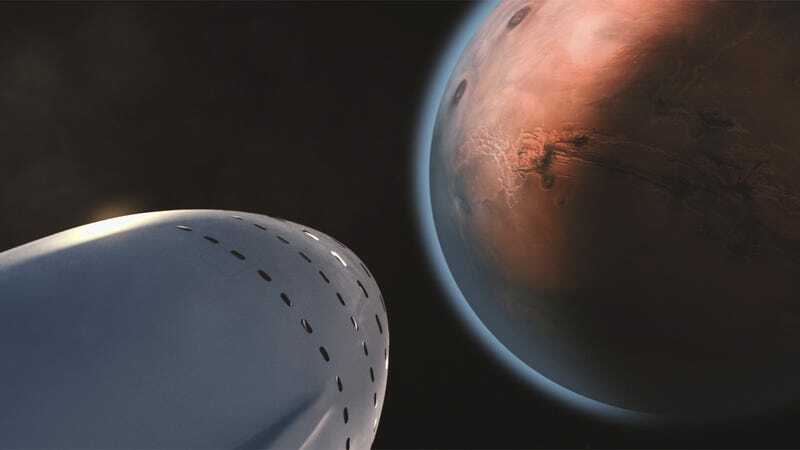 “The goal of SpaceX is really to build the transport system,” said Musk, before suggesting that the Martian colonists themselves would do much of the building. “Who wants to be among the first to build everything, from refineries to the first pizza joint?” Musk asked. But before we can build a pizza joint on Mars, people will need a whole lot of other things, including but not limited to clean and usable water, a space habitat capable of withstanding Martian environments, some kind of transport, and presumably some more people who would eat there. Musk also failed to explain who—if anyone—is actually going to build and maintain that basic infrastructure. Without it, the plan is unlikely to succeed. If SpaceX’s plans to get to Mars do succeed, though, we could be looking at trips even further out. As I noted yesterday, Musk has hinted at the possibility of using this transport system to go beyond Mars—and it appears that future plans could be heading that way. 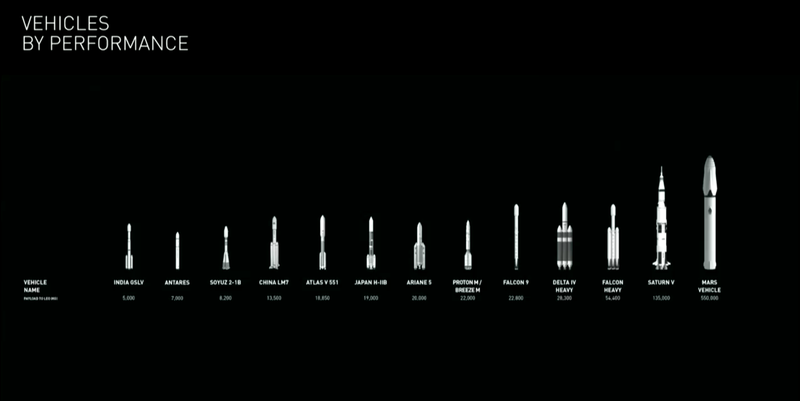 “If we have a propellent depot, you can go from Mars to Jupiter, no problem,” Musk said. “It means full access to the entire greater solar system.” He noted a particular interest in traveling to Europa. The first step, though, would be establishing regular travel—or even a first trip—to Mars. And to see if that’s really possible, we’ll have to wait.